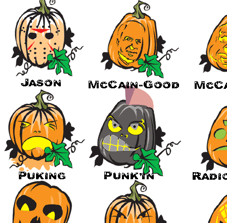 Download 48 free pumpkin patterns with instructions from Extreme Pumpkins. Each pattern will print on its own page and you’ll be able to keep the file as long as you want. For a limited time, this has been reduced to $0.00! Click on the “add to cart” button. This will send you to the shopping cart. Fill out the order form. When the order confirmation page appears, click the “Download” button. This will download the file to your computer in a .pdf format. Get started planning that perfect Halloween jack-o-lantern a bit early this year. they have 1000’s of pumpkin patterns, It’s really the Best Pumpkin carving site on the net, they even have a web forum to help others learn to carve. this is wayy too hard to get. why bother with all that, ya know?